It was characteristic of the Volga Germans to settle into communities. They settled in concentrated areas of Colorado, Nebraska, Kansas, and the Dakotas where they comprised a high percentage of the foreign born population. Portland is the only large ﻿Volga German settlement in Oregon﻿. The first Volga Germans in the American West, about seventeen families, arrived in Portland in 1881 after spending several years on the dry, grasshopper-infested Kansas plains. Members of this vanguard included Conrad Appel, Phillip Fuchs, George Green, Henry Repp, and several Kleweno's, Ochs's, and Schierman's. They had first immigrated to Rush and Barton Counties in Kansas between 1875 and 1878. Most were natives of the villages of Neu Yagodnaya, Schoental, and Schoenfeld, which were daughter colonies of Yagodnaya Polyana and neighboring Pobotschnoye. The group obtained special emigrant fares through the Union Pacific Railroad and Oregon Steam Navigation Company to travel to Portland where they had heard good farmland was available. Many Germans from Russia originally settled in Canada near Calgary and later transitioned to Portland and rural areas in Eastern Washington. In his book Palouse Country: A Land and its People, Richard Scheuerman writes that after their arrival in Oregon, the Volga Germans were disappointed to find that the best lands had already been taken and what ground was available was unfit for cultivation. 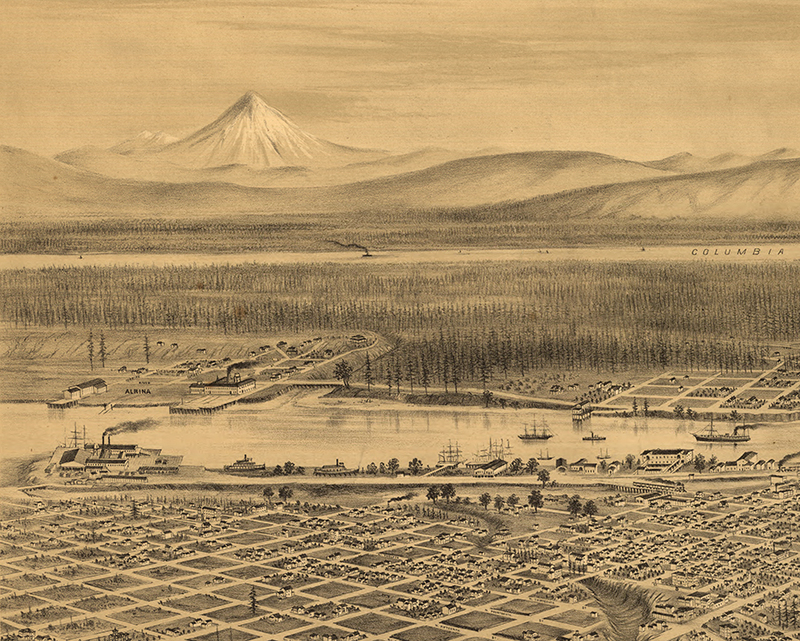 The frustrated immigrants turned to working at a local lumber mill and working for the railroad, which was then grading the huge Albina fill in present Portland. Map of Portland looking east across the Willamette River to the small settlement of Albina in 1879. Source: Library of Congress Catalog Number 75694937. In the spring of 1881, the Volga German “Kansas Colony” families learned that the railroad officials were offering to sell 150,000 acres of “the finest agricultural lands in the northwest,” east of the Cascades, which would be accessible by rail in 1882. When approached by the Volga Germans, the railroad officials saw their opportunity to implement their new plans for colonization of the Palouse country in Washington. Several representatives traveled to eastern Washington to inspect the available lands. The vanguard returned favorably impressed with the land’s fertility and the hilly topography which reminded them of the Volga Bergseite. Railroad magnate, Henry Villard chose a retired brigadier general Thomas R. Tannatt, who had commanded Civil War Union forces, to be the general agent of his new company, the Oregon Improvement Company, which was headquartered in Portland. Tannatt later arranged for colonization of the Palouse by the Volga Germans and other immigrants. The German Russian families that briefly settled in Portland were later instrumental in the colonization and development of the Palouse country near the towns of Endicott, St. John, Dusty, and Colfax. George Rath, in his book, Emigration from Germany through Poland and Russia to the U.S.A., states that the oldest and most important settlement of Evangelical Volga Germans in Oregon is the one in Portland. It goes back to the year 1882 when colonists from Norka, who had at first settled in Iowa and Nebraska, came by train to San Francisco. These immigrants worked for the Union Pacific Railroad and were either brought to or terminated their employment in San Francisco. From there they sailed by ship to Portland where they were employed as day laborers in factories. In 1888-1890 after some years in which there were no new arrivals, Portland received an influx of Volga German colonists from Balzer and Frank. However, the great majority of Russian-Germans came to Portland between 1890-1905. Colonists from Alt-Norka (Old Norka) comprise the bulk of around 500 families in the existing settlement. They populated an entire ward in northeast Portland and were organized in a number or religious congregations. Haynes, Emma S. My Mother's People. N.p. 1959. Print. Scheuerman, Richard D., and John Clement. Palouse Country: A Land and Its People. S.l. : S.n., 1994. Print.